Chester Electric Wire Rope or Electric Chain Hoists and Tractors can be equipped for air operation . Our standard air package includes vane or piston motors and brakes with modulating valves for infinitely variable hoist motion. Single speed trolley or tractor motion is standard using vane motors and our standard worm gear reducers. Standard controls include a two or four lever pendant. 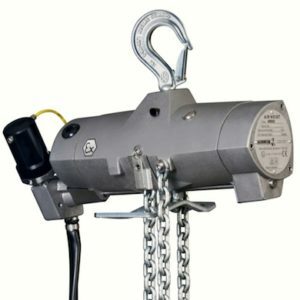 Chain hoists are supplied with limit valves for both up and down hook travel. 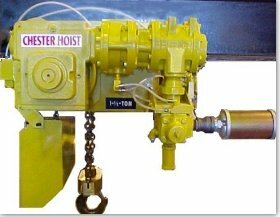 Wire Rope hoists are supplied with upper limit valves only. Please contact our experts with your specific requirements. 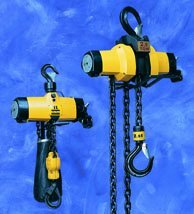 CATALOG NUMBER RATED CAPACITY IN SHORT TONS STANDARD LIFT IN FEET **MINIMUM RADIUS CURVE MINIMUM DISTANCE FROM BOTTOM OF I-BEAM TO HOOK IN INCHES NOMINAL HOIST SPEED (FPM) CFM @ 90 PSI NET WEIGHT, LBS.